The genial MGM comedy Callaway Went Thataway opens with a few scenes straight outta 1951 - a brawny cowboy atop his mottled stallion, vanquishing the bad guys and riding off into the desert with his lovely heroine. A panning out reveals the movie being broadcast on television, with a diverse array of kiddies enraptured by the singing cowpoke. What follows is a cute satire, scripted and directed by Norman Panama and Melvin Frank (White Christmas, The Court Jester), which gently satirizes '50s consumer culture and its constant need for new sensations. In this case, that new sensation is a washed-up sagebrush star who hasn't been seen in public for a good ten years. What to do? 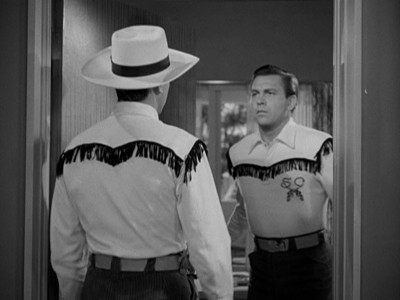 While it doesn't offer much in terms of surprises, Callaway Went Thataway served as an excellent vehicle for MGM's sturdy new singing actor, Howard Keel. 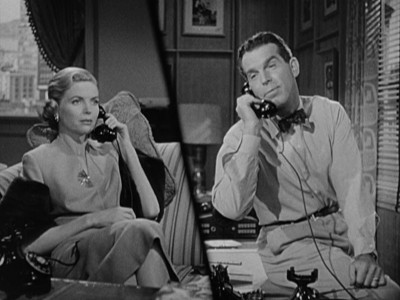 In a dual role (the cowboy movie star and the double hired to take his place) that required more comedy chops than singing ability, he's capably joined by Fred MacMurray (already in befuddled Disney-ready mode) and Dorothy McGuire as two savvy advertising executives with a quandary on their hands. Facing the never-ending demand for products that feature Keel's Smoky Calloway, Mike Frye (MacMurray) and Deborah Patterson (McGuire) are unable to do their jobs. Why? Because Calloway hasn't made a picture in ten years, and no one knows the reclusive actor's whereabouts. Mike and Deborah seek out the assistance of Calloway's salty old agent, Georgie Markham (Jesse White), who goes on a tour of Mexico's seediest bars to locate the elusive, hard-living man. Desperate for someone to fill Callaway's boots, Mike and Deborah turn to a letter written by a peeved Colorado ranch hand named "Stretch" Barnes. Although Stretch's letter chastised the TV station for daring to run movies starring a guy who looks like himself, Mike and Deborah notice enough resemblance to take the next train out to Colorado - eager to convince Stretch that he could pass for the real thing. After figuring out how much cash he could get, Stretch reluctantly agrees to go along - just long enough to earn the amount needed to buy his own ranch, however. The satirical jabs in Callaway Went Thataway function more like gentle pokes, but it actually gets in one pointed observation - that these smug Hollywood types are so full of themselves, they fail to notice that this earnest, meek ranch hand isn't the same person as the strapping cowboy. Despite needing crash courses on how to act, perform stunts and face the public, Stretch ultimately ends up getting used to the job - even convincing people who worked with Callaway in the old days that he's the same guy (how dim are these people, anyway?). Stretch's resolve to hitch it back to Colorado as soon as possible gets dulled by the fetching McGuire, however, as he winds up falling in love with her. This is disrupted by the surprise return of the real Callaway, who drunkenly demands an end to Mike and Deborah's fake-cowboy scheme. Callaway's people fail in their attempts to rehabilitate the unruly, out-of-shape actor, however, leading to an intricately staged fistfight involving Keel and Keel. If Callaway Went Thataway seems a little toothless as trenchant satire (knowing how dependent the '50s movie studios and television producers were on each other, MGM didn't want to bite the hand that feeds 'em), Norman Panama and Melvin Frank's assured point of view makes things snappy. The duo was in an unusual position of being able to produce, write and direct their own films, resulting in a breezy affair. The difference between over-the-hill Callaway and young buck Stretch is only conveyed with dark makeup on Callaway's face - the rest is just Keel's acting. I also enjoyed the realistically portrayed romance that comes up between Stretch and McGuire's Deborah. What I found most enjoyable about Callaway Went Thataway was the relaxed cast. MacMurray and White bring a lot of character to the proceedings, while Old Hollywood buffs will get a kick out of the cameo appearances of Esther Williams, Clark Gable and Elizabeth Taylor. The movie also sports some nice work from figures more familiar in other media - Gilligan's Island's own Lovey Howell, Natalie Schaefer, is delightful as an executive's flirty wife, while the radio/cartoon legend Stan Freberg has a few fun scenes as the nebbishy office boy at MacMurray and McGuire's workplace. The 4:3 full screen image on this Warner Archive release is derived from a sharp-looking print. The black and white film sports a few instances of scratches and vertical lines. White specks are a more common occurrence. The picture is appealingly mastered, however, with a nice range of greys that convey a strong resolution without getting too much contrast. The mono soundtrack also manages to be nicely preserved - a few pops here and there mar a generally undistorted, pleasant-sounding track. No subtitle track is included on this disc. 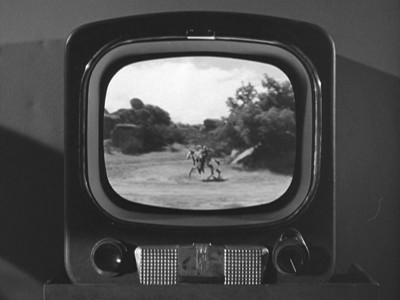 MGM's original Theatrical Trailer is included, a sneak preview which indicates the film's wacky flavor while giving away a little too much of the story. No other extras. 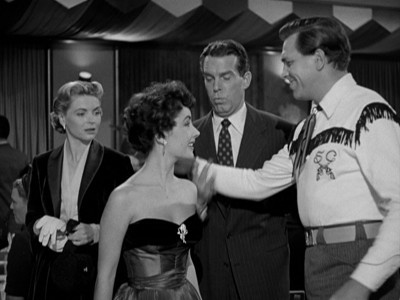 Cute stuff - despite a predictable plot, Callaway Went Thataway bears the snappy imprint of '50s comedy team Norman Panama and Melvin Frank. 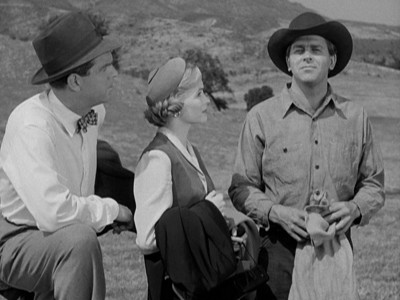 This Warner Archive release satisfies as a slick, leisurely paced Hollywood sendup with Fred MacMurray, Dorothy McGuire, and a surprisingly great Howard Keel in dual roles as a washed-up cowboy star and his earnest ranch-hand double. Recommended.